The celebration of the spring equinox Navruz has many names – Noruz, Nowruz, Nowrooz, and Nawruz. It is the the spring “New Year”, a holiday celebrated for the last 3000 years. Celebrated worldwide, the holiday was officially recognized as an international holiday by the UN in 2010. Described as the International Day of Nowruz – a spring festival of Persian origin celebrated for over 3,000 years in the Balkans, the Black Sea Basin, the Caucasus, Central Asia, the Middle East, it unites people from diverse ethnic communities and religious backgrounds and signifies new beginnings and brings hope for the year to come. Originating in Persia, the ancient Khorasan and long associated with the ancient Zoroastrian religion, its name means “new day” in Farsi because for ancient Persians it marked the first day of the New Year. On this day, Persian kings would have worn a crown with images of the annual solar cycle on their heads, participated in the divine mass in the Temple of Fire, and distributed generous gifts to citizens. Today, Navruz is celebrated each year on March 21, when the sun enters the sign of Aries on the astrological calendar. The date coincides with the spring equinox, and marks the beginning of the spring in the northern hemisphere. As Turks and other nomadic peoples moved into Central Asia and areas around Persia, they adopted the celebration of Navruz. Just as the Saxon holiday of Ostara was embraced by Christianity and become Easter in the West, Navruz traditions, which had grown strong roots in the life of Eurasian farmers and townspeople, survived the coming of Islam to the area 1.400 years ago. 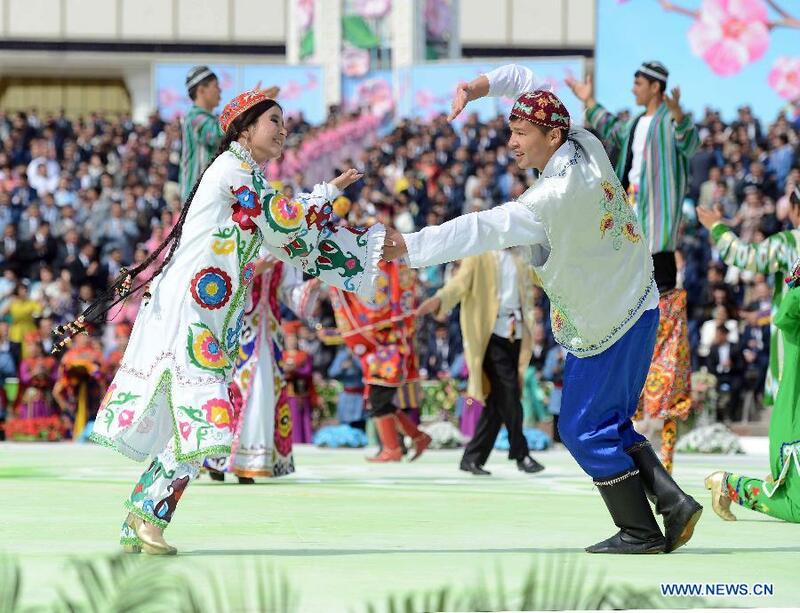 Navruz is celebrated widely and colorfully in Iran, Azerbaijan, Afghanistan, Uzbekistan, Tajikistan, Kyrgyzstan, Kazakhstan, Turkmenistan and the western provinces of China, as well as the Kurds in Turkey, Syria and Iraq and the Tatars and Bashkirs in southern Russia. Each year Navruz is marked by concerts in parks and squares, trade fairs and national horseracing competitions. In most of the Silk Road countries, Navruz announces the joyful awakening of nature after winter and the beginning of the agricultural cycle of cultivating, planting, and harvesting. Navruz traditions are similar throughout the region, and have varied little over the centuries, except to embrace Islam. Unlike the western New Year traditions, Navruz is celebrated during daytime hours within the family circle. March 21 is the main celebration, but for the next 13 days it is common practice to visit friends and relatives, buy and plant seedlings of fruit trees and have cheerful gatherings in the fresh spring air. Traditionally, it is also a time to “clean up” one’s life. People tidy up their homes, wash rugs and draperies, decorate with flowers, and buy new clothes that they will use for visiting. On the day of Navruz, all housekeeping – including the preparation of the meal, careful cleaning of the home and the arrangement of blossoming branches from apricot, peach, almond or pomegranate trees – must be completed before the rising of the morning star. Children enjoy the holiday because they often get presents of money, as well as blessings, from their elders. The activities of the first 13 days of the New Year are considered harbingers of the year to come. For this reason, it is traditional to end quarrels, forgive debts and overlook enmity and insults. It is a time for reconciliation, when forgiveness and cheerfulness are the dominant sentiments. As with the celebration of the Chinese New Year, there are traditions associated with the first visitor to the house during Navruz. To ensure good luck for the coming year, this person should have a “happy foot”; he or she should be kind, gentle, witty, and pious and have a good reputation.